Defence Force striker and the Trinidad and Tobago Pro League’s all-time top scorer, Devorn Jorsling, has scored his last goal in the red, white and black strip. Jorsling, who failed to break into the Trinidad and Tobago squad for the 2015 CONCACAF Gold Cup, declared today that he feels his last chance to play in a major tournament for the “Soca Warriors” is gone. “To be honest, I believe that under the present coaching staff I won’t be getting a look in anytime soon,” said the 31-year-old Jorsling, who was the Pro League’s top scorer in the just concluded season. “Because if I am displaying this kind of form now and I’ve got in shape and I still can’t get into the 23, then when would I ever get into the team? Farewell, number nine. 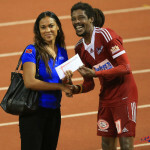 Trinidad and Tobago Pro League fans and die hard Warrior fans would mourn Jorsling’s passing. Although the supporters who only show up for the glamorous international matches would wonder what all the fuss is about. Jorsling’s tally of 17 international goals from 40 outings is the tenth best Trinidad and Tobago return of all time. From the strikers available to Warriors head coach Stephen Hart, only Cornell Glen’s 23 goals from 67 caps and Kenwyne Jones’ 18 items from 70 caps were more prolific for their country. Glen, incidentally, is not in the squad either and has not been picked since the 2013 Gold Cup, after which he headed to the Indian professional circuit. 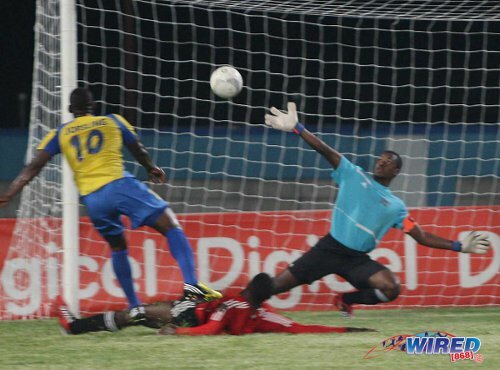 Photo: Defence Force striker Devorn Jorsling (left) hammers the ball past then Central FC goalkeeper Marvin Phillip. The reason that many fair weather fans might shrug their shoulders at Jorsling’s retirement is that his 17 goals were all scored against Caribbean opposition: Antigua and Barbuda (5), St Vincent and the Grenadines (4), Guyana (3) and one apiece against Barbados, St Kitts and Nevis, Jamaica, St Lucia and Haiti. He has never scored in a World Cup qualifier nor played at a Gold Cup tournament. And, in a self-fulfilling prophecy, that has become a reason not to play him when the big games come along. In truth, Jorsling’s international career was partly stunted by the glut of quality forwards on the scene at the time. He made his debut in 2008 under Colombian Francisco Maturana when the likes of Stern John, Jason Scotland, Cornell Glen, Kenwyne Jones and Darryl Roberts were all in the mix. Jorsling is neither a dazzling dribbler, a pacy frontman nor an aerial bully. So, without height or athleticism, he maximised his own less flashy talents to the point of making an art of it. Scoring seems overrated in the modern game, if only because few championship teams cherish poachers these days. Apart from Jorsling, consider Argentina’s Gonzalo Higuain, Mexico’s Javier Hernandez, Netherland’s Klaas-Jan Huntelaar or, perhaps, Colombia’s Radamel Falcao. “To be honest, they aren’t many ‘number nines’ left,” said Jorsling. “When you look at (Luis) Suarez and so on, most teams opt for a false nine or a floating striker. But then football is always changing and maybe two or three years down the line they might go back to a classic nine. Hart declined the chance to have Jorsling as an option at the Gold Cup. Willis Plaza, Jonathan Glenn and Jones are more versatile attackers. Tellingly, none of those three started their senior careers as classic centre forwards. Expect Pro League fans to moan if and when the Warriors do need a poacher to bring off the bench. Although Hart suggested that fitness issues rather than talent has curtailed Jorsling’s chances over the last two years. The Defence Force striker has done appreciable individual work over the last six months and he looks leaner than ever. 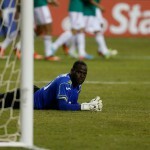 But, apparently, doubts linger within Trinidad and Tobago’s technical staff as to whether Jorsling can be trimmer still. An injury before the Warriors’ Gold Cup opener against Guatemala on July 7 might have opened the door for the poacher while it is not inconceivable that Hart could opt for something new for the 2018 World Cup qualifying campaign, which starts in October. But Jorsling, frustrated and hurt, feels he cannot wait in line anymore. “No disrespect to the current players but I don’t see myself being left out of a 23-man squad,” said Jorsling. “I know that Kenwyne brings that experience and pedigree to the team but, otherwise, I don’t think there is as much talent as before when I started. 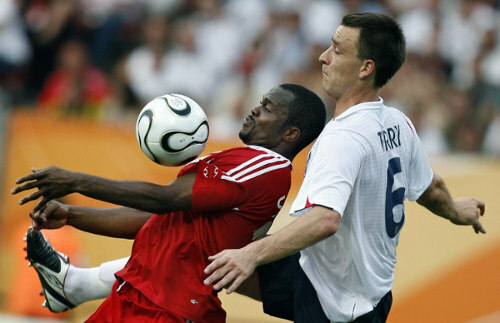 Photo: Trinidad and Tobago’s record goal scorer Stern John (left) controls the ball under pressure from England’s John Terry at the 2006 World Cup. Jorsling scored three times from one start and three substitute appearances under Maturana. But he was only ever considered a local alternative for the foreign stars at the time. His best spell came under coach Russell “the Little Magician” Latapy when he plundered ten goals from 15 appearances. “Latapy is the first coach who honestly gave me an opportunity,” said Jorsling. “I had to work my way up under Latapy too but I felt confident and that I can be myself. Hence the number of goals I scored under him. 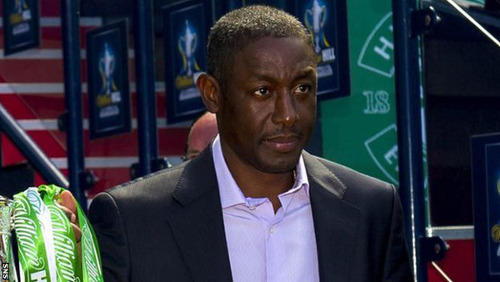 Photo: Inverness assistant manager and former Trinidad and Tobago football star and coach Russell Latapy. Jorsling got his first taste of World Cup qualifying action under Latapy as he played for 36 minutes at the Azteca Stadium in a 2-1 loss to Mexico, 13 minutes away to Costa Rica in a 4-0 defeat and then from the start in a 2-2 tie at home to Mexico. 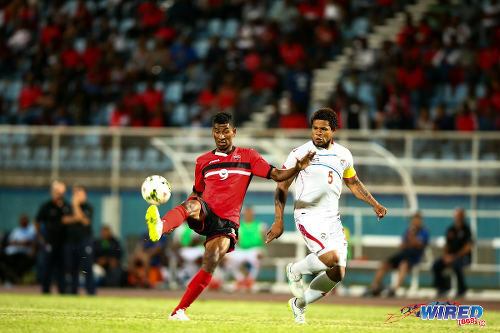 “Two memories stood out for me while playing for Trinidad and Tobago,” said Jorsling. “I remember the night when Latapy told me I would skipper the team the next day (against Antigua and Barbuda). The next one that was playing in such an amazing atmosphere at the Azteca Stadium in Mexico. But there were lean days ahead after Latapy was sacked in December 2010. Jack Warner quit football, six months later, and the Trinidad and Tobago Football Association’s finances went with him. In the next two years, the Warriors played just four friendly matches and their form dipped drastically. 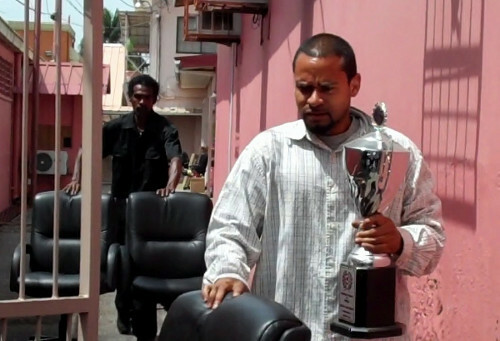 Photo: The Soca Warriors had court-appointed marshalls remove the TTFF’s assets on 8 February 2012. Jorsling made only two appearances for Otto Pfister and did not score in a combined 75 minutes of playing time. He scored a hat-trick in his debut under Hutson Charles, against Antigua, but found himself relegated behind younger, faster but not necessarily deadlier strikers like Jamal Gay, Richard Roy and Plaza. 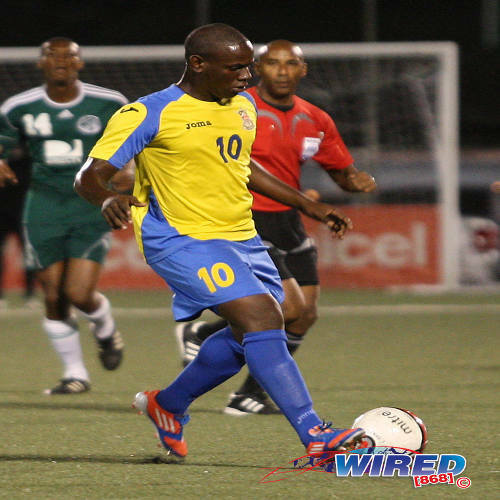 His last international goal came against St Vincent in a Caribbean Cup qualifier at the Dwight Yorke Stadium in Bacolet on 14 November 2012. At the time, Jorsling’s tally read: 17 goals, 30 caps. He failed to score in his next eight outings for Charles and Jamaal Shabazz and was also goalless, this year, in two substitute appearances for Hart against Curaçao and Jordan. 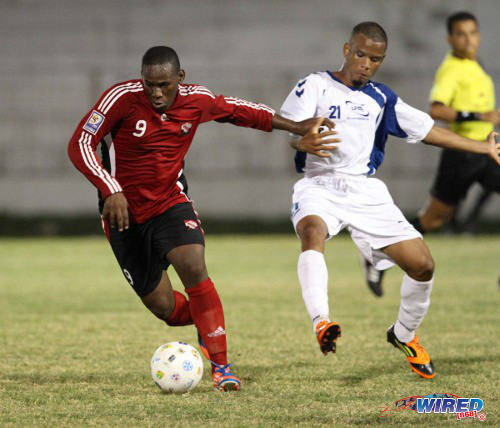 Photo: Trinidad and Tobago striker Devorn Jorsling (left) brushes aside a Martinique player during the 2012 Caribbean Cup semifinals. The goals kept flowing at Pro League level though and Jorsling’s form during the 2014/15 season, in particular, suggested that the Warriors might have a “fox in the box” for the Gold Cup. But Hart decided to go without a classic number nine. Jorsling wished his teammates well at the Gold Cup and hinted that the door was not closed entirely. But, for now, he has given up on adding to his international goal tally. “Everything is subject to change because I am a member of the TT Defence Force and my priority is to serve my country,” he said. “But at the present moment, I feel that it is best to retire. If i can’t get a chance now, when will I get the opportunity again? “Of course I wish my teammates all the best and I hope they do well because that will determine a lot for the upcoming World Cup (qualifying campaign) and the future of Trinidad and Tobago’s football. Photo: Defence Force winger Jemel Sebro (far left) and Devorn Jorsling (far right) celebrate with teammates during a Pro League fixture against W Connection. Jorsling’s focus will now switch to the Pro League where his overall returns of 136 goals—five more than San Juan Jabloteh’s Kerry Baptiste—is a domestic record. Only Pro League fans would be able to appreciate his lethal finishing now. Editor’s Note: RSSS credited Devorn Jorsling with 18 goals although one strike against Guyana was actually played in a scrimmage that was not registered as an international game.